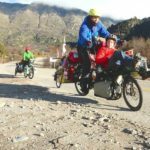 For over a year and a half, Happy Family BIOcycling has been bicycle touring from Argentina to Colombia. This troop of four visits organic and biodynamic farms, certified and Non-Fair Trade producers, staying with local farmers using the WWOOFing program (volunteer farmstays). Along the way, they are learning new techniques from organic farmers in different environments and cultures, and are also trying to understand the full production including international export, as well as the social impact of this cycle. What a brilliant way to grow up – just sayin’! This video has been pieced together as part of a crowdfunding campaign to continue to California, USA. If you’d like to support this project you can click HERE. You can also follow Happy Family BIOcycling via Facebook.